When peppers are in season, I just can’t help buying them. I love the taste and colour of sweet peppers and put them in everything. I eat them raw, with or without dip, stir-fry them, put them in salads, grill them and every once in a while stuff them and bake them. Once I found myself with 9 peppers in the house, and since there are only two of us, I thought I’d better use them up. 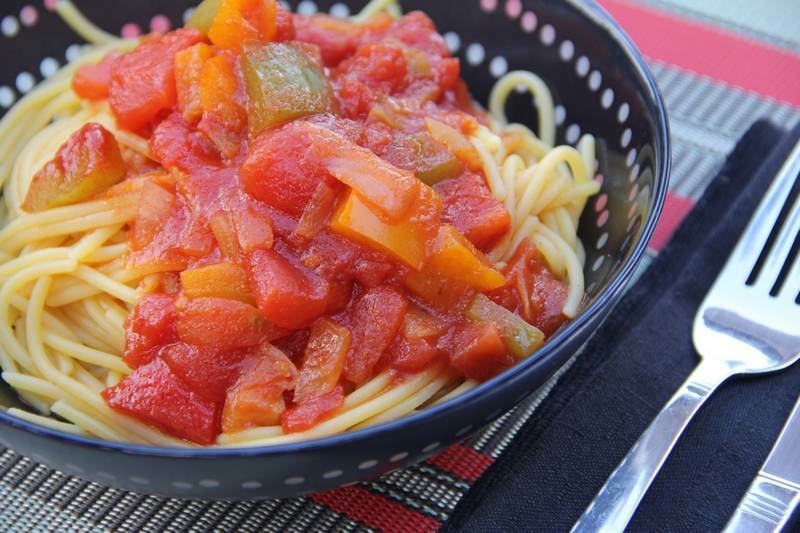 I made a simple tomato sauce that has been a favourite ever since. This sauce is a little sweet even if you omit the optional sugar. It’s meant for pasta but it also goes well on top of grilled chicken or in an omelet. I haven’t tried it but you could probably dip corn chips in it for a splurge. Sauté the onions, garlic and peppers in the olive oil until done. Add the sauce and tomatoes, breaking up the whole tomatoes. (I use scissors for this and do it right in the pot). Depending on how thick you like the sauce, remove some or all of the liquid from the tomatoes. You can always add it back if necessary. Season with sugar (if using), salt and pepper. Simmer for a while. You’re done. This recipe yields about 14 cups of sauce so you will probably want to freeze some. The total calorie count is about 100 calories per cup. This guest post was brought to you by Sonia Ribaux of Clicking50. She’s an amateur photographer with great style and flare. Her blog gave me the inspiration to start blogging almost 1 year ago. Merci Sonia!! Thank you Arlene. Maybe our kids will take advantage of all these great recipes and feed us? Hi Holly: This recipe is almost identical to the one I make. It is a great sauce. Thanks for sharing. I misplaced the recipe for your gazpacho soup. Could you re-send it please. Thanks.